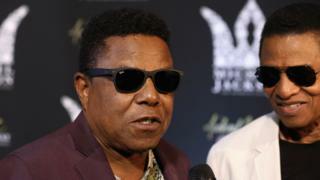 Four members of Michael Jackson's family have given an interview to defend the late pop star ahead of a controversial new documentary. Speaking about Leaving Neverland on CBS, brothers Tito, Marlon and Jackie and nephew Taj Jackson rejected the film's claims that he abused children. In the HBO and Channel 4 documentary, James Safechuck and Wade Robson claim they were abused by the singer as children. Marlon said: "If Neverland was so horrifying for them, why would you keep going back?" None of the Jacksons who were interviewed on CBS's This Morning had watched the documentary. "I trust my attorney," Marlon explained. Asked whether they ever found Michael Jackson's behaviour around children odd - such as sharing a bed with children - Taj replied: "I grew up in it so for me it wasn't odd. I think to the outside world, yes, it can be odd, I mean I'm not oblivious to what it sounds like. "But when you're actually there in that atmosphere and you're around it and you're watching movies with his kids, Little Rascals or Three Stooges... it's very innocent. "The fault of my uncle was he didn't have that bone in his body to look at it the other way. His naivety was his downfall in a way." Jackie said: "I know my brother. He's my little brother. I know my brother. He's not like that." Taj added: "It's always been about money, I hate to say it about my uncle, it's almost like they see a blank cheque." Fellow brothers Jermaine and Randy Jackson did not take part in the CBS interview, and nor did Michael Jackson's sisters, including LaToya and Janet. But the group said every member of the family "feels the same way". Taj said: "I think there's a fear to put more energy to it - I think that's why my aunt Janet hasn't said anything because she doesn't want to make it any bigger." Jermaine told ITV's Good Morning Britain last month that there was "no truth" in the two-part film. Leaving Neverland director Dan Reed appeared on the CBS show on Tuesday to defend his film. The broadcaster will air an interview with Mr Robson and Mr Safechuck on Thursday. Mr Robson appeared as a witness in the singer's 2005 child abuse trial, saying under oath that the pop star never abused him. Asked why the "stories had changed", Reed said: "What people find it difficult to understand... is the deep attachment that forms between the groomer and the groomed. So both Wade and James were in love with Michael. "Even after the sexual activity stopped, they continued loving him and he was a close friend, particularly with Wade, for a number of years." The singer was cleared of all charges at his trial. He died four years later. Asked why he didn't ask the Jackson family to give their side of the story, Reed said: "What does the family know about the sexual abuse that happened? "We know the family and the estates and Jackson, when he was alive, and his lawyers all denied that any sexual abuse took place and those views are strongly represented in the film." The documentary will air on HBO in the US on Sunday and Monday. Michael Jackson's estate is now suing HBO for $100m (£77m), claiming the film breaches a non-disparagement clause in an old contract.